ISLAMABAD: Pakistan has requested China to incorporate 4,500 Megawatts Diamir-Bhasha Dam project in China-Pakistan Economic Corridor (CPEC) umbrella projects, as to make its early and speedy construction possible and win over the energy shortage in the country. 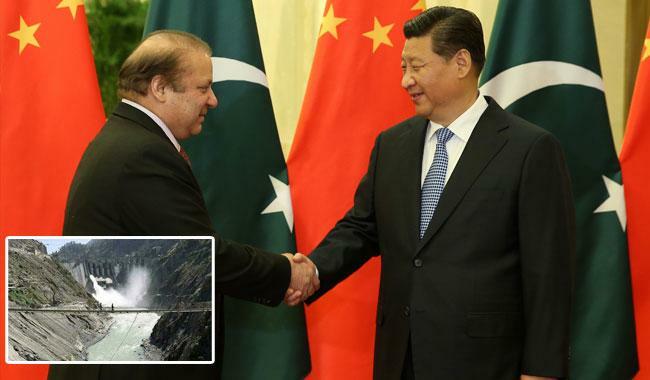 Physically, the project lies on the Karakoram Highway (KKH) along the China Pakistan Economic Corridor and falls within the sectors selected for bilateral cooperation. Its cost is around 14 billion US dollars. The Federal government has allocated Rs32 billion in its Public Sector Development Programme (PSDP) 2016/17 for the land acquisition and other works. On completion, it can triple the storage capacity from 30 days to 90 days. “We have requested Chinese to incorporate Bhasha Dam in CPEC umbrella projects,” the Federal Minister for planning development and reforms said while attending the Senate standing committee on planning and development here Friday. The committee observed that despite the claims about the development of Gwadar, the government has failed to resolve the water and electricity issues of the area. On paper, the government is presenting a rosy picture of power generation, but on ground the condition is very different, and people are facing severe load shedding, Senator Tahir Mashhadi said while presiding over the meeting of the committee. Ahsan Iqbal while expressing his views about delay in projects in Balochistan, said, “No project in the province can be completed unless the capacity of the local governments and provincial departments were enhanced.” He said billions of rupees were spent on the water supply schemes in Quetta but there is no developmental work on the ground. While blaming the provincial officials for the delay in the execution of the projects the minister said that projects are facing delays mainly because of provincial departments. “Besides facing the capacity problem, the provincial departments have shortage of good people,” the minister added. The secretary planning while briefing the committee informed that 10,400 MW early harvest projects will be completed under the CPEC. He said that Thar power plants would start working in three years and will cost $2 billion. Sachal power plant 124 MW will start work in next two months and 300 MW power generations from Quaid-e-Azam power will resume from December. The officials of the Water and Power ministry informed that the governments of Khyber Pakhtunkhwa and European Union are working on a project for the micro hydro power generation. “The federal government also brings such a model in AJK and GB,” they said adding that they are negotiating with German donors for the Micro Hydro Project. Senator Mohsin Laghari said, “Our electricity tariff is unrealistic; we don’t want only electricity but cheap electricity.” Senator Mashadi said that hydro power is the cheapest source of energy but the government is undertaking expensive Thermal power generation. “The consumers are finally going to take the burden of expensive electricity,” he added. Senator Saifullah Magsi said that Prime Minister Nawaz Sharif has inaugurated Jhal Magsi dam three years ago but, so far, no funds were allocated for the project. Senator Sirajul Haq informed the committee about meetings with GB’s officials and said that the province has the capacity of 40,000 MW Hydropower generation which is the cheapest source of energy.